Shape meat into 8 thin patties. Place 1 Tbsp. cheese on center of each patty; press meat around cheese to completely enclose cheese. 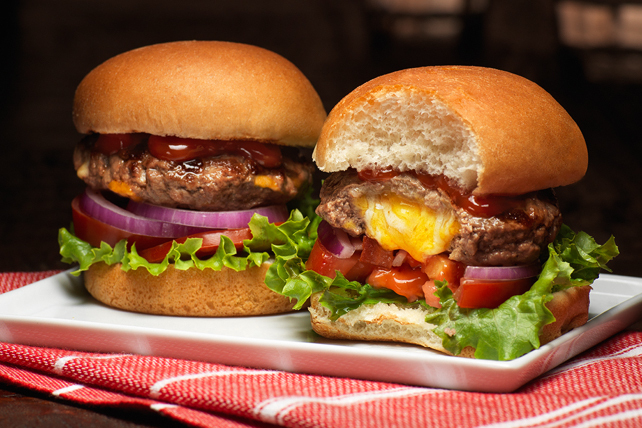 Roll each into ball, then flatten into 1/4-inch-thick patty. Grill 3 to 5 min. on each side or until done, adding buns, cut sides down, to grill to toast for the last 2 min. Place lettuce, tomatoes and onions on bottom halves of buns; top with burgers and ketchup. Cover with tops of buns.